Pipe bursting sounds exactly like what every homeowner dreads most. While an unplanned bursting of a pipe without a professional present can be costly and cause a great amount of water damage, professional pipe bursting is a solution in trenchless sewer line repair for severely damaged sewage systems. Find out the many benefits to this seemingly harmful method of trenchless plumbing. Pipe bursting involves using trenchless techniques to intentionally break severely damaged sewer lines in order to make way for replacement systems. These methods often use mechanically applied force and high-grade bursting heads in order to properly burst the pipes. As the technique is completely trenchless, there is no need to rip up the site of the pipes. It also eliminates the need for toxic chemicals that are typically used during the trench excavation procedure. The entire process takes much less time than traditional pipe replacement, as the plumbing crew does not have to spend time digging or cleaning up a giant mess. A typical, and usually complex, sewer main dig-and-replacement averages between $7,000 and $25,000 for the person paying. Professional pipe bursting costs much less as it takes less time and fewer people. Fewer workers also mean that less equipment will be operated and that the company will save on equipment maintenance. As cleanup will be at a minimum, the plumbing company will also save money in that aspect. Although the excavation of plumbing systems is a very common method for pipe replacement, it is not a very safe one. During the excavation process, mold and asbestos are common obstacles. When workers encounter either of these contaminants, they have an increased risk of developing long-term effects of mold and asbestos exposure, such as mesothelioma. When crews instead use trenchless pipe replacement methods, they significantly lower the risk of mold and asbestos exposure. Although residents would not have as close contact with the contaminants as the workers do, the trenchless method also reduces the risk for anyone in the general vicinity. Professional pipe bursting is a great option for anyone who has a system that needs serious repair. If you think you could benefit from this procedure, call a trenchless repair company today. A home’s sewer line may be invisible, but it is one of the most important parts of the household. It is the channel for all contaminants and impurities to leave the house. If it is damaged, not only does your house suffer, but the cost of sewer line repairs can be more of a commitment than a casual spend. 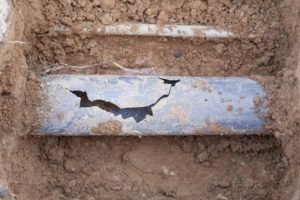 Know these common causes of sewer line damage so you can be ready to prevent it in the future. Sagging Sewer Line: Unfortunately, this first cause is not something that is in your control. Sagging sewer lines tend to happen over time, no matter your specific plumbing system. A pipe is considered sagging when it starts to sink due to the ground or soil conditions. The low spot in the line will then start to collect paper and waste, resulting in recurring blockages. Tree Root Infiltration: If you have older sewer lines, they could be prone to tree and shrub roots growing through them. These determined plants will search for sources of water as they grow, so they tend to latch onto a sewer pipe. 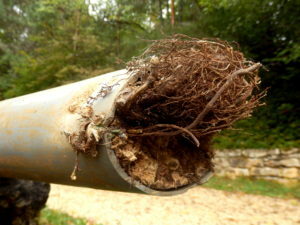 If the pipe is made of clay or has looser connections, the roots can grow inside the pipe. As they expand, the line can break and you may need sewer line repair. Pouring Grease Down The Drain: One thing you can prevent is dumping grease, fats, and oils down your sink drain. If you pour grease down the drain, not even running hot water after it will help wash it away. Instead, it hardens as it cools off and sticks to your pipes, leading to clogs. Always pour hot grease in a coffee can or jar and then throw it out once it solidifies. Flushing Debris Down The Toilet: Similarly, flushing anything down the toilet that shouldn’t be flushed there can cause major damage. Flushing debris of any kind can lead to clogs, a burst sewage line, or the need for trenchless sewer line repair. Severe Pipe Damage: A sewer line is often damaged when there is pipe damage. If a pipe is broken or ruptured, the sewage can’t properly drain through the system, leading to frequent backups. By knowing these common causes, you and your household can work to prevent them. In the case of damage that happens over time, be sure to call the professionals at Trenchless Replacement Specialists as soon as possible to conduct sewer line inspections and repairs. Quitcha Ditchin! copyright © 2016 Trenchless Replacement Specialists, all rights reserved.